As forecasters accurately predicted, August was replete with disappointing weather. However much to our delight, the Met Office have raised hopes of an Indian Summer with an optimistic three-month outlook. News of this forthcoming weather shift is very welcome in slowing the sobering message that summer is drawing to a close. So there’s still plenty of time for exploring the outdoors rather than the TV listings. Bearing this in mind, we’ve put together some ways to get the most out of our amazing British trees before they shed their leaves and the winter chill ushers us indoors. Whether you’re happy grabbing branches at a limit of six feet off the ground, or simply have to reach the top, tree climbing is an easily sourced and cost-effective outdoor activity. It isn’t just for children – high flung antics range from the guilty pleasure to the long lost hobby for people of all ages. The tactile experience that comes with clambering up nature’s own climbing frame is a truly unique one. Branches are wonderfully complex to the touch and provide perfect perches where a simple breeze can have a liberating sensation. For those seeking extra excuses to justify their playful penchant, tree climbing is also great exercise, especially for the arms and legs. If you’re not a confident climber, you can always consider tree climbing courses. Children will, for once, be encouraged to disappear up a tree in a vertical fashion with instructors on hand to ensure safety at every step or swing. At Blue Forest we’re big fans of not just climbing trees, but living amongst them. You may not have the backyard to build your own, but you can still experience a Blue Forest treehouse first hand. Quality Unearthed have a luxurious and lofty Blue Forest tree house nestled inside the lush 44 acres of expansive private farmland in Sussex. Get there in time for late summer or early autumn and you will be marvelling at the changing foliage. 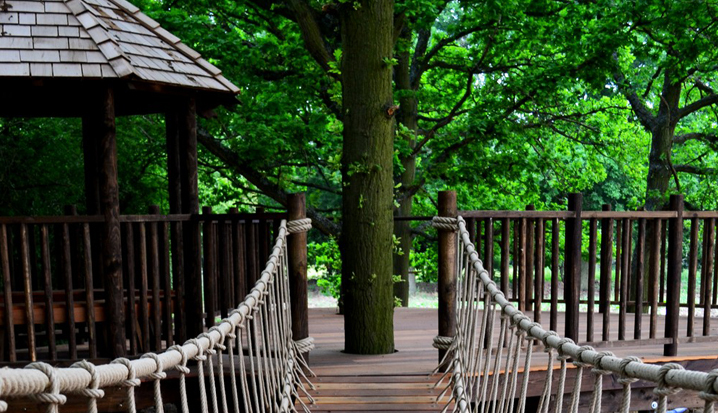 This wifi-ready treehouse is built around a mature oak, sleeps two two adults and has bathroom and cooking facilities. Return from a verdant voyage, clean yourself up with the en suite hot Monsoon shower and then chill out with some in-cabin entertainment on the widescreen TV. Enjoy your locally sourced organic breakfast hamper on your private deck overlooking the picturesque pastoral landscape. Explore the local area. Sussex is home to many pretty villages and pubs as well as vibrant areas like Tunbridge Wells. Camping is an equally ideal way to get that coveted sense of tranquility amongst the trees. Britain is ripe with gorgeous rural environments that are just right for the occasion. As you can probably imagine, the best part of camping is what goes on outside. Most campsites have an abundance of gorgeous walking trails that will take you through some wonderful woods. Smoky campfires are also a particularly pleasant part of any camping experience that can be used for hosting late night discussions or toasting a marshmallow. For the more reluctant campers there are many campsites that provide a range of more civilised living spaces including yurts, lotus bell tents, wagons and shepherd’s huts. These are usually kitted out with a variety of beds, futons and cooking equipment so if you have a fear of cooking on open flames, you needn’t worry. The Blackberry Wood campsite in particular features a commissioned Blue Forest “ecoPERCH” or “Curvy Cabin” as it is affectionately known. Made from sustainable materials, it sleeps four people, contains a modern kitchen and bathroom and a wood burning stove for that extra comfort factor. In this instance, you can enjoy one of the beautiful organic living spaces that trees can provide while sitting harmoniously within a natural landscape.